Definitely there aren’t many places in Europe that have their own traditional dance and their own typical cake. “Splitski akvarel” is the musical dedicated to Split.Its author Ivo Tijardovic was a Croatian composer, writer and painter born in the city of Split, when it was still a part of Austria. He studied music and architecture in Vienna. Since March 5th 1926 Splitski Akvarel is every year on program at the Split’s National Theatre.It conjures the magic of Split between two World Wars in one of the Split’s oldest suburbs: Veli Varos. This cheerful, swaying operetta is full of catchy melodies and witty replica about love, hope and everyday life of “a small man” in the city of Split. It is traditional dance from the beginning of 20th century.The dance consists of 3 different dances: Monfrina, Quadruple and Saltine Regiment. The main features of the dance are elegant movements, soft steps and refined demeanor. It is influenced by western Mediterranean. 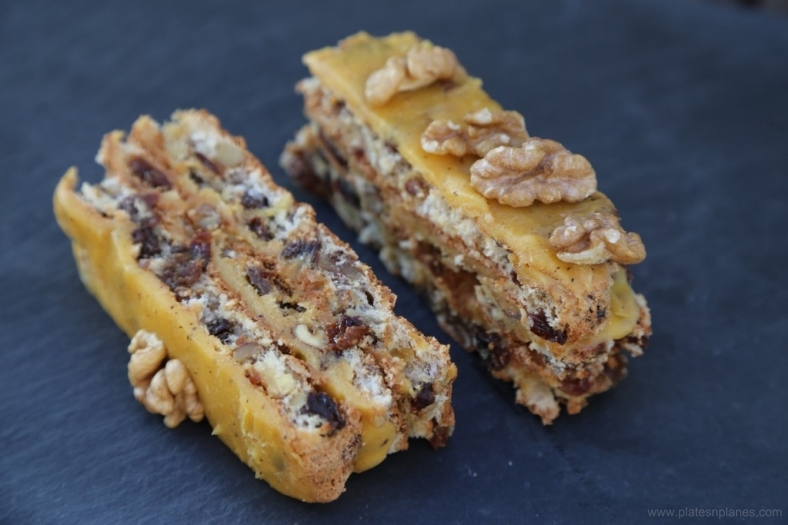 And finally: SPLITS’ TORTE (SPLITSKA TORTA) as its name says is created in Split with ingredients typical of the area: dried figs, raisins, walnuts. You can make it in shallow, rectangular baking pan, dimensions 35cm x 45cm. 9 tablespoon of sugar 1.Cut walnuts, raisins, dried figs in small pieces, then mix them together with flour. Cut walnuts, raisins, dried figs in small pieces, then mix them together with flour. In a large mixer bowl whip egg whites and with the mixer still running sprinkle granulated sugar into it. Continue whipping until firm peaks form . Then carefully add all ingredients into the mixture and lightly stir it all together. Spread it into rectangular baking pan, lined with parchment paper. Bake it in preheated oven cca 30 minutes on 180C until yellowish. Cook it all together on BAGNIA MARIA (heatproof bowl set over a saucepan of simmering water) until cream becomes thick. When the cream is almost cool add butter and stir it until completely melted in vanilla cream. Then cut the cake layer in rectangular strips along the long side of pan. Top each slice with cream, finish with cream on top of the cake and around all sides of the cake. 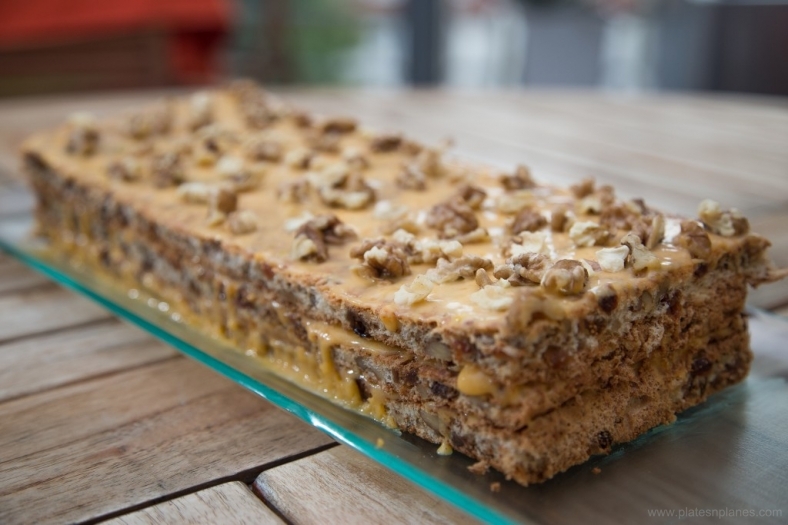 You can decorate it with halves of walnuts. Serve with cold whipped cream.